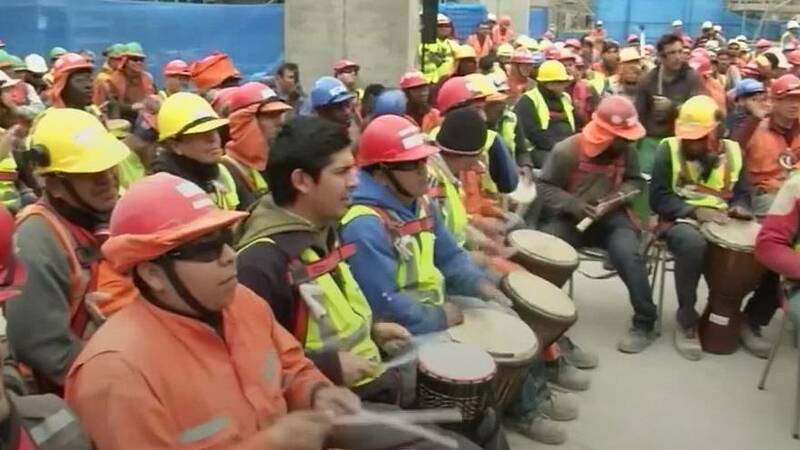 Hundreds of construction workers in Santiago, Chile, took a break by playing the drums on site Wednesday. Sponsored by the Chilean Construction Chamber and led by Chilean musician Pedro Greene, the therapy session was hailed a success by Greene, who has led drum therapy sessions across Chile. "The emotional factor is very important because music invites happiness and good vibes," Greene said. Honorindo Rojas, a construction worker who participated, said: "This is really good for our work, for all of us because it gets us out of the psychological and mental stress from the work. This is good for all of us."